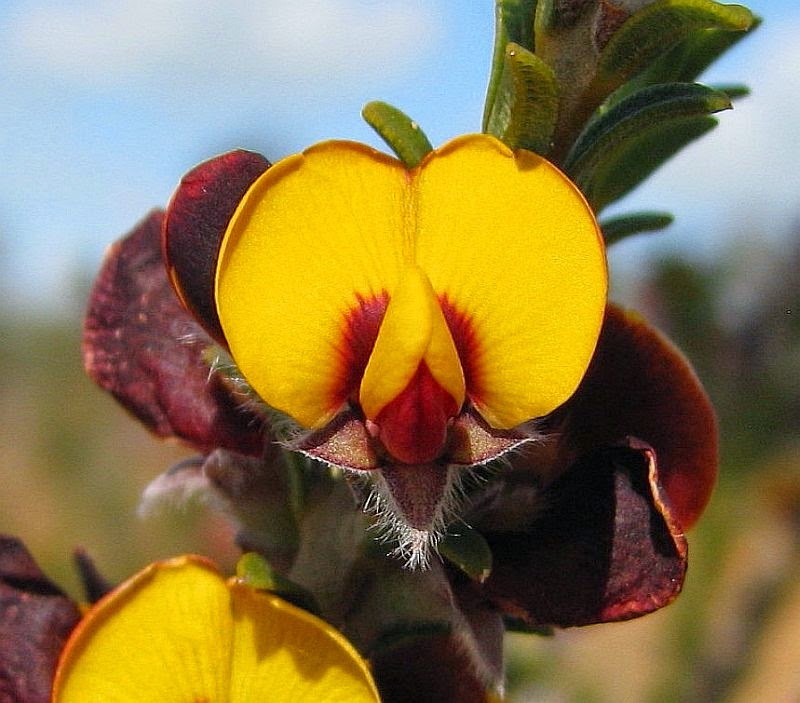 This species along with a number of others were transferred to Gastrolobium from the Nemcia genus in 2002, which was detailed in a review titled Monograph of Gastrolobium (Fabaceae: Mirbelieae) by GT Chandler et al. I mention this because an unusual feature of many plants from this group is their dimpled lower leaf surface, where the leaf venation is thickened and raised to produce depressions between (punctate), which reflects this species botanical name. This punctation is a very noticeable feature and is what initially attracts the eye to this plant. 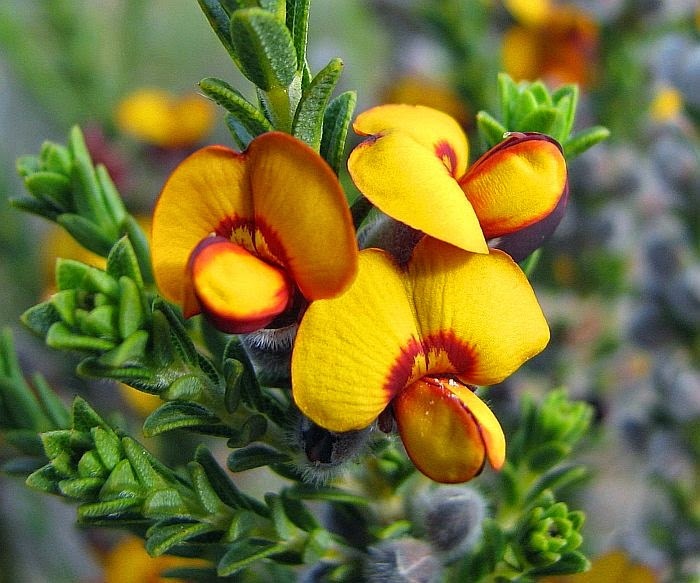 Besides the interesting foliage, it has bright yellow and red flowers and grows to around a metre (3’) in height. 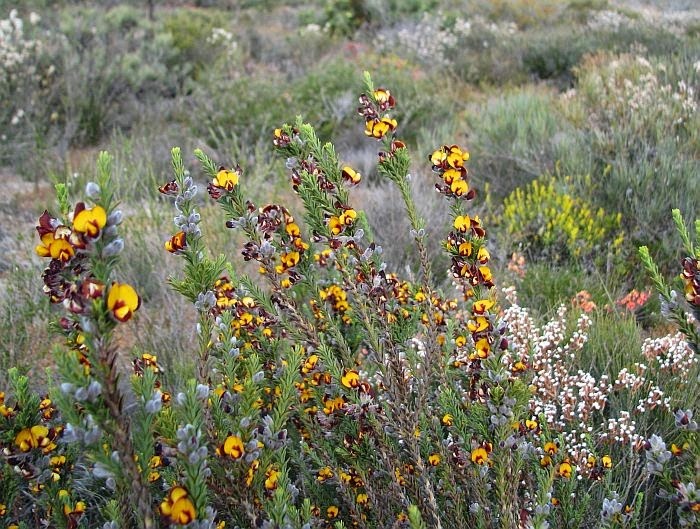 It locally favours gravel/clay soils with other heath vegetation, although further west where more common, it often grows in various sandy loams. 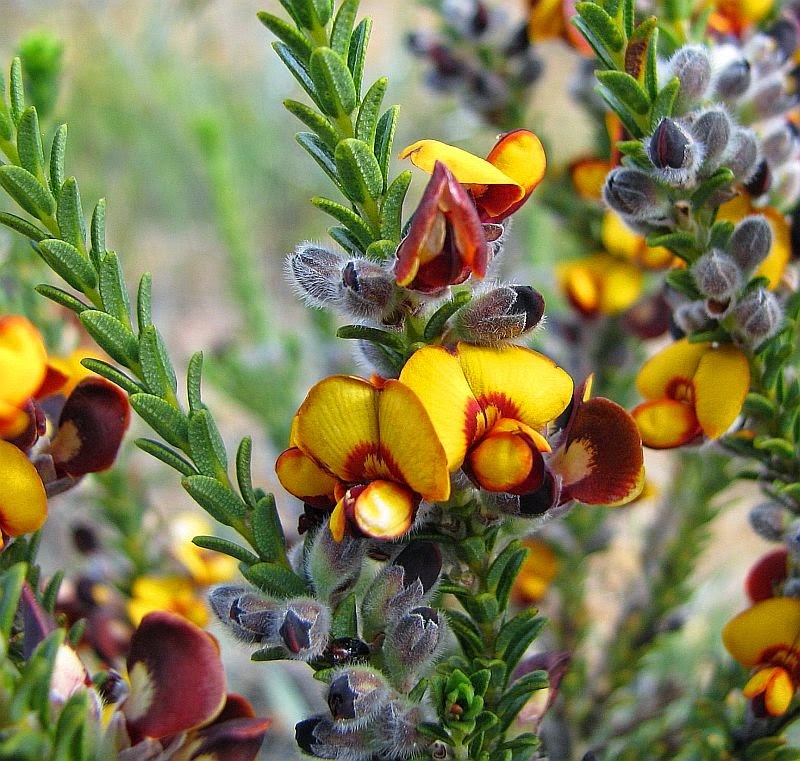 Esperance is close to this species most easterly occurrence (the above photos taken a little to the NE of the town), with its main distribution being from Ravensthorpe to the Stirling Range and Lake Grace to Narrogin. There is another very similar Gastrolobium (also ex Nemcia) called G. reticulatum, whose distribution overlaps with G. punctatum over much of its range; it too has a dimpled lower leaf surface. The main observable difference however is the shape of the leaf, although the leaf lengths are also noted as being distinctive, which although correct requires some clarification. 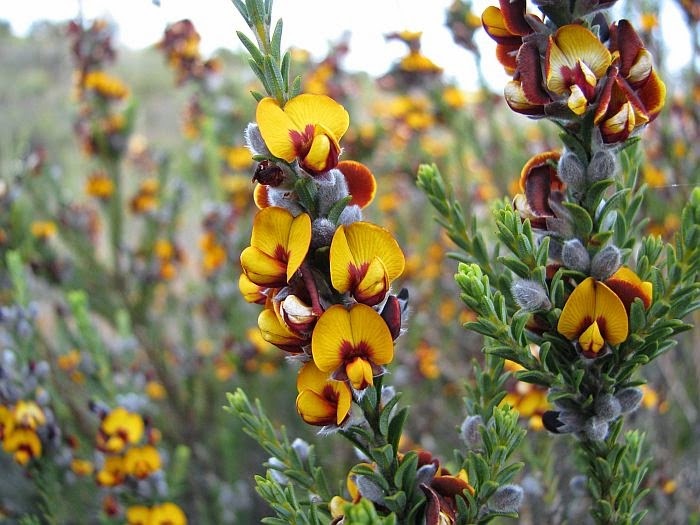 G. punctatum is stated as being 8-12 mm, whilst G. reticulatum being less than 8 mm in length, however the older foliage of G. punctatum is often less than 8 mm in length too, but grows longer after flowering. It is the leaf shape of Gastrolobium punctatum however that is consistent, which is pointed at the top, plus tapers to the petiole (stalk) with the widest portion being in the centre; G. reticulatum on the other-hand is shaped more like a arrowhead and widest at the bottom. Also the leaves are recurved away from the stem with G. punctatum, but held vertically next to the stem with G. reticulatum. 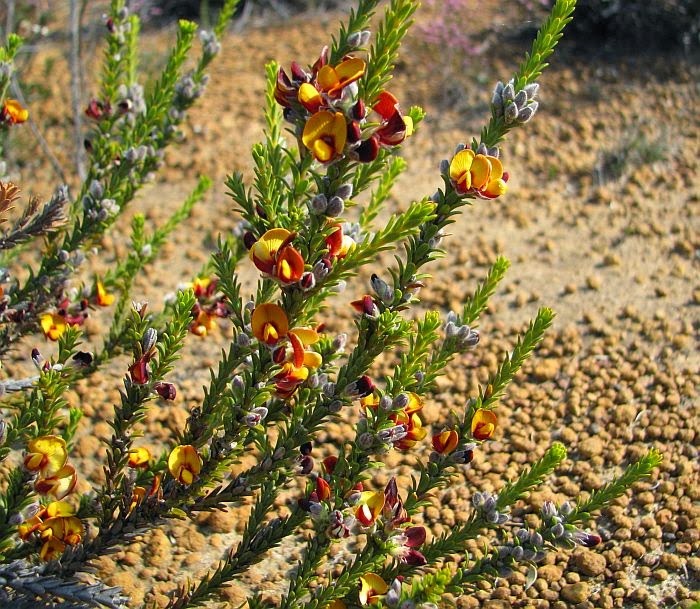 In the key the G. reticulatum leaves are listed as in whorls of three, as against G. punctatum being irregularly whorled, but this is not especially the case in the Esperance region, although it may be a more reliable feature further west in their main distribution area. 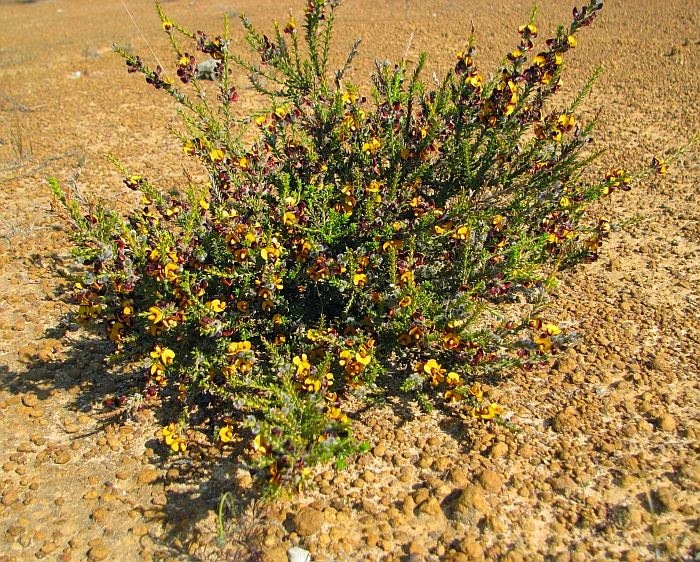 The flowering period for Gastrolobium punctatum is September to October. Gastrolobium is part of the very large and diverse Fabaceae family, but may also be listed under Papilionaceae or Leguminosae elsewhere.